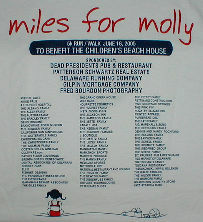 The Rebel Runners enjoyed a warm, sunny morning at the 5th Miles for Molly 5k Run/Walk on June 18, 2005 in Wilmington. 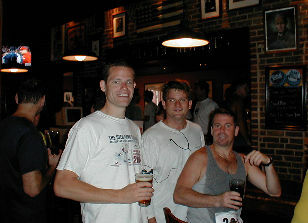 The interesting course started and finished at Dead Presidents Pub on Union Street and ran through tree-lined streets to Rockford Park and back. 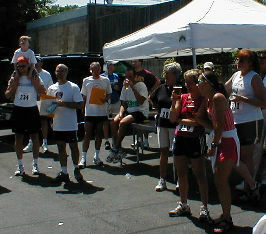 Approximately 325 runners and walkers participated. K-Drive took her age group 6 days after her remarkable 3:08:45 Edinburgh, Scotland marathon. Over a dozen Rebels ran. 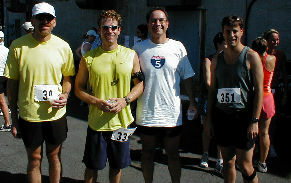 Some race highlights: Winning time was 16:40. 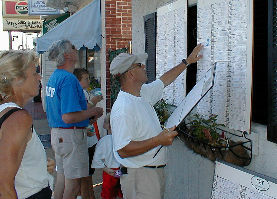 Mike K. finished 15th in 19:00 flat, capturing his division. "Sit down" Rich came in 16th overall with a brilliant 19:22 for 3rd in his age group. 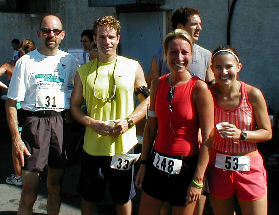 "Silent Mike" cruised into 19th place overall with a 19:27. "Invisible Mike" dusted off the rust with a 20:26, good for 28th place overall. "Rebmaster" Ray was content with 20:44, 16 seconds off his PR. 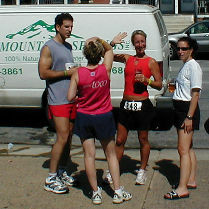 K-Drive eased into her age-group win in 20:49, resting up for a sprint triathlon the next day. "Procrastowitz" displayed great form with a 21:22, just 6 days after the Edinburgh Marathon. Water is great, but beer is better!